If you are like us and you added up the time you spent on the beach without hits over your lifetime it would probably add up to a few weeks. We put together this article to help you zone in on the times where the bite is going to be hot! This is all part of our goal to help you spend more time fishing. It turns out that water temperatures are a major factor for big Bulls. Big Bullsharks tend to be inshore when water temperatures are in the mid to low 70's. When it gets to cold they often move offshore to enjoy the warmer waters of the Gulf Stream. When it gets to hot they often move north to enjoy cooler waters. The best tides for catching big bulls are within the red lines. When you are fishing for Bullsharks you may notice that a majority of your hits tend to happen around a certain tide. We have found after some study that the best tide for catching BIG bulls is the first hour before and after the tide has changed. This is surprisingly accurate and can be used in both inlets and along beaches. 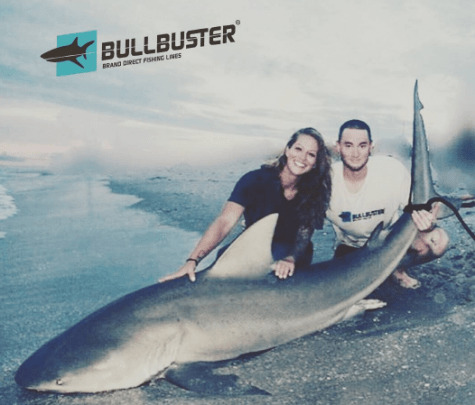 Nice Bullshark landed by #BullbusterAmbassador Team Ninja Sharkers. We hope this article helps you spend more time fishing (or more time catching) To spend more time fishing get a hold of our Brand Direct fishing lines directly from our factory to you. Basic Weight For Landbased Shark Fishing - This article talks about how to make a basic weight for landbased shark fishing including a few tips you might not have thought about. The 5 Best Landbased Shark Fishing Baits - Ever wonder what the best baits for landbased shark fishing are? Here are a few that will get the job done every time.